Struna 1MU antenna package and tethered mast on display at MAKS2007 (Author). The 52E6MU low altitude early warning radar system was one of the most obscure, but also most interesting exhibits at the MAKS 2007 aerospace exhibition. 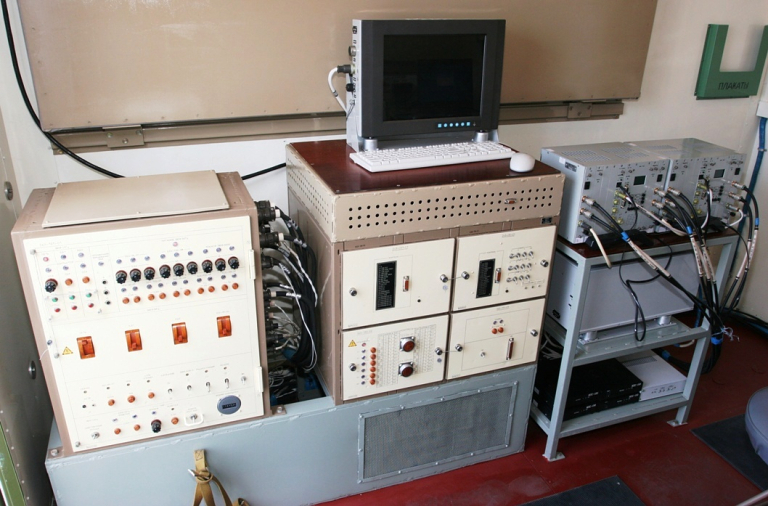 This system was developed by NNIIRT, based at Nizhniy Novgorod, now a division of the Almaz-Antey Joint Stock Company based in Moscow. The 52E6MU is in series production for the armed forces of the Russian Federation. The purpose of this system is to provide border protection of a geographical area, such as a national geographical border, an urban area, a specific restricted area, a mountain pass, a coastal bay or estuary, against low flying low Radar Cross Section targets, including cruise missiles, low observable aircraft, light aircraft, ultralight aircraft, powered parawings, parachute deployed special forces, balloons and other low flying targets. 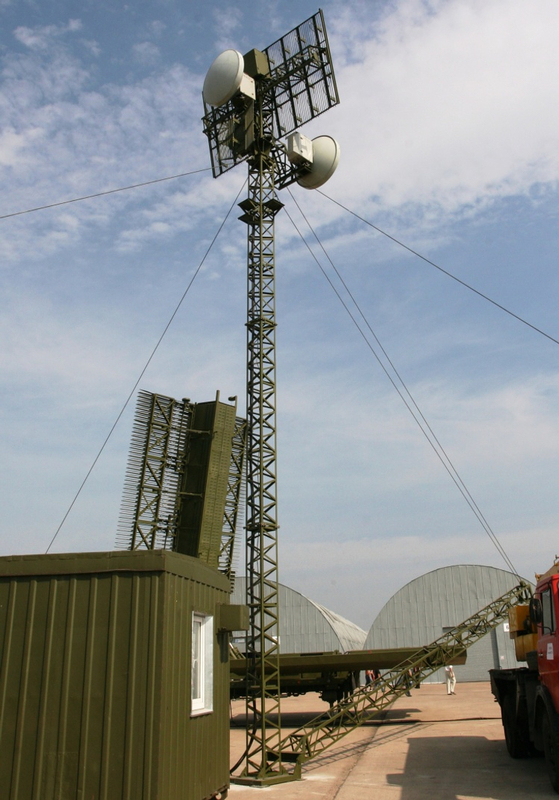 The 52E6MU is essentially a new style of radar system, based on bistatic radar technology. Due to the inverse square law constrained forward scattering effect seen in bistatic systems, the volume of space between the transmitter and receiver has sufficient electrical field strength to permit the reliable detection of targets otherwise difficult to detect using conventional monostatic radars, which are constrained by the physics of the inverse fourth power law. Russian sources claim that the effective bistatic radar signature of targets in this regime is 2 to 3 times greater than the monostatic signature of the same target. They have also stated that this is largely independent of surface coating performance, permitting detection of low observable targets2. A unique feature of the 52E6MU design is that its transmit power source is a radio communications relay channel operating in a conventional point-to-point transmission regime, carrying regular digital and communications traffic. 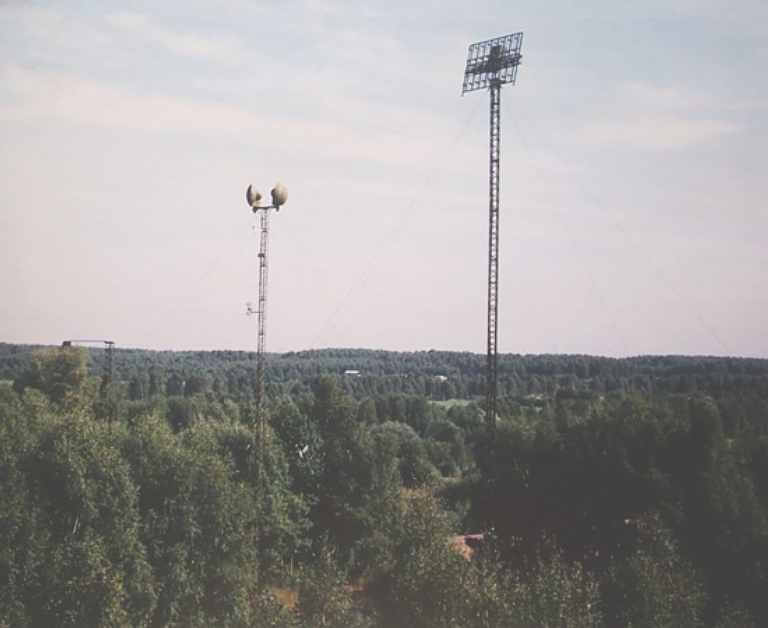 Radiated power is extremely low, which also permits the deployment of system components in close proximity to urban or other inhabited areas3. Work on the first variant of the system, labeled the 52E6 Struna 1, and performed by NNIIRT, was completed in 1999; NNIIRT researchers are continuing development to further improve its operational and performance parameters. The system operates at a frequency of 450 MHz, although other sources claim a frequency range between 390 to 430 MHz. Target detection probability is cited at 0.8 to 0.9, at a False Alarm Rate of 1 spurious detection over a 72 hour interval. The first variant has a cited operational life of 40,000 hrs between overhauls. The area coverage footprint for the first variant of the system was cited at 50 to 400 km, subject to the number of stations chained at separations of up to 50 km. The current variant, which is in serial production for the armed forces of the Russian Federation, is designated with the 52E6MU industrial code, and believed to be named the Struna-1MU. The principal difference between the initial variant and the series production variant is the use of newer basic technology, which permits smaller containers and lower power consumption for deployment and operation of the system. 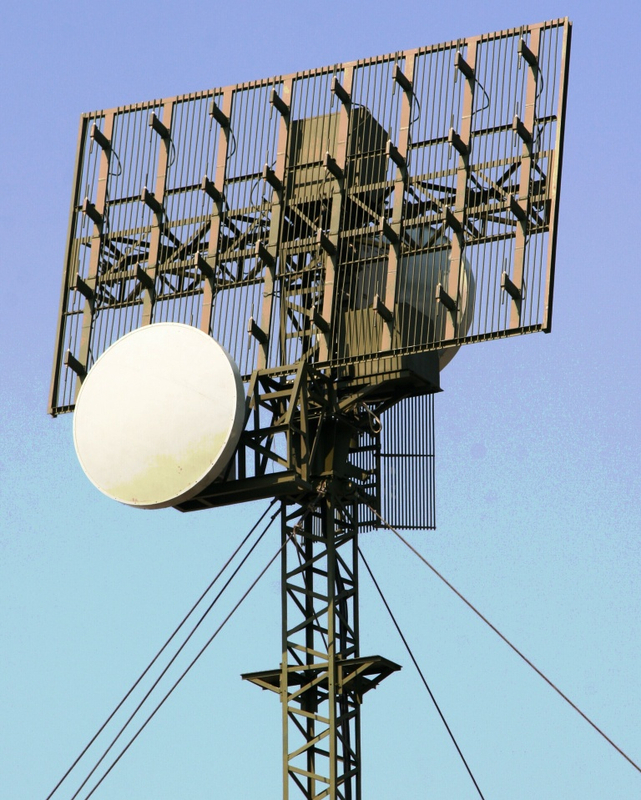 Current variants of this unique radar system, offered to potential foreign customers under the Barrier-E export designation, can create a coverage footprint of up to 400 km in length, where all information is received, processed and displayed on a single workstation. This design is essentially a bistatic radar system, which permits operation across multiple spans. The processing software can determine target altitude and flight direction, and also performs non-cooperative identification and classification into target categories. The length of a single span between two stations is up to 50 km. The width of the single span coverage footprint is between 1.5 and 8 km, subject to the target type and distance from the transmit antenna. Altitude coverage is between 30 m and 7 km. Single span coverage footprint (NNIIRT). Barrier coverage footprint using chained parallel 40 km coverage spans (NNIIRT). Receive and transmit antenna detail. Note the colocated microwave communications link antennas (Author). Antenna and tethered mast assembly (NNIIRT). The receive antenna is a planar dipole array, mounted on standoffs over a 5 x 2.5 metre base. The antenna is located on a tethered lattice frame tower structure, with a total height of approximately 25 m, including the frame mounting the antenna and 10 to 11 structural frames. The antenna base mounts the array of 32 dipoles, in 4 rows of 8 dipoles each. Receiver hardware is installed in a box shaped housing mounted on the rear face of the antenna. A typical high density coverage barrier is formed by emplacing transmit/receive station spans in two parallel chains, separated by 10 to 11 km, with stations in each span separated by 40 to 50 km distance, the latter determined by local terrain elevation along the span. A transmit/receive station, termed a PPP (Priyomno-Peredayushchiy Post), is located with each antenna/mast subsystem. Each PPP module has a power consumption of 0.8 kiloWatts. A complete system requires only one operator station, termed an RMO (Rabocheye Mesto Operatora). Receiver outputs collected by all stations in the system are relayed via embedded communications channels to the RMO data processing system, which performs tracking and displays outputs for the operator. Each RMO module has a power consumption of 0.3 kiloWatts. Total radiated RF power for the 52E6MU system is 1 to 10 Watts (0 - 10 dBW). The processing software can identify and classify four categories of targets - light aircraft, heavy aircraft, helicopters, and cruise missiles; other sources claim five categories, where heavy aircraft are sorted into fighters and bombers. The 52E6MU Struna 1MU system generates target track outputs at 1 second intervals. Accuracy of target tracks is 80 – 200 m normal to the boresight line of a span. 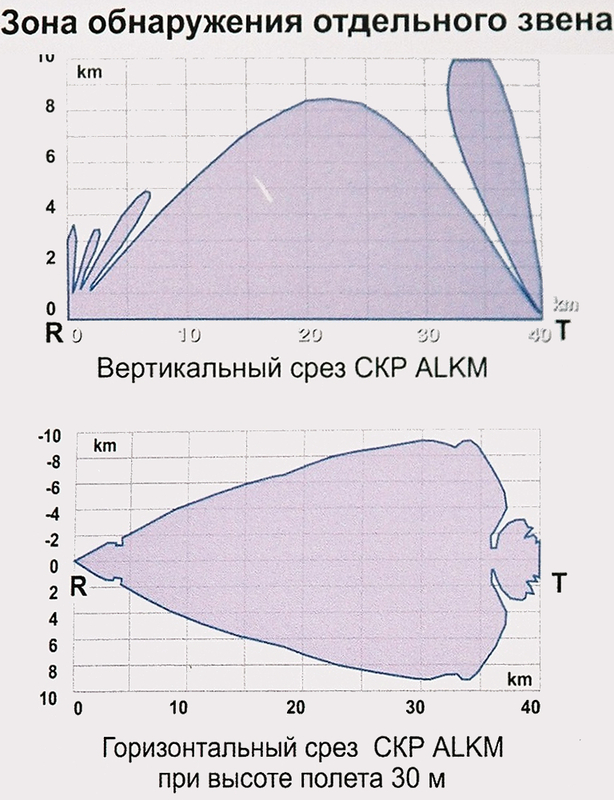 Other sources claim that the system determines air target coordinates and kinematic parameters with an accuracy of 2,100 m along the span boresight, 170 m normal to the span boresight, 1° in azimuth and 5.8 m/s in velocity. The claimed target detection probability is 0.89. Five targets can be individually tracked within each span. The manufacturer claims a single false alarm per 72 hour interval. A BIT i.e. self test system can isolate faults down to two modules. The service interval in continuous operation is 2,500 hours. Personnel requirements are a single operator per RMO container, and one technician per PPP container. First published as Miroslav Gyűrösi, Radarový systém 52E6MU Struna-1MU, ATM journal, May, 2008, URL: http://www.atmonline.cz/archiv/5-2008.htm; translated and posted with permission. This claim is based on the fact that surface and edge treatments used in low observable designs are typically optimised to minimise surface currents and backscatter from specific aspects, such as the forward hemisphere. This idiosyncrasy of the design technically qualifies it as Passive Coherent Location (PCL) system, using similar technology to the US LM Silent Sentry design, refer: Lockheed-Martin, Silent Sentry, Product Webpage, available at http://www.lockheedmartin.com/products/silent-sentry/index.html. 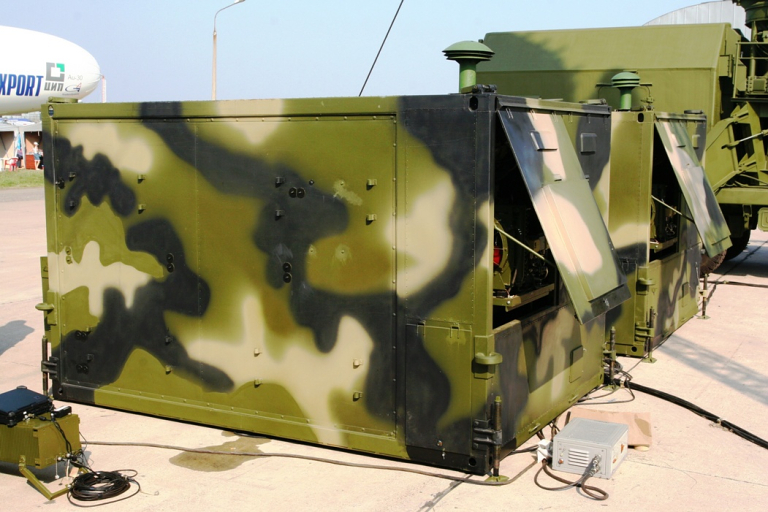 Above: a PPP transmit/receive station and RMO operator station container; below: interior equipment in PPP container (Author). 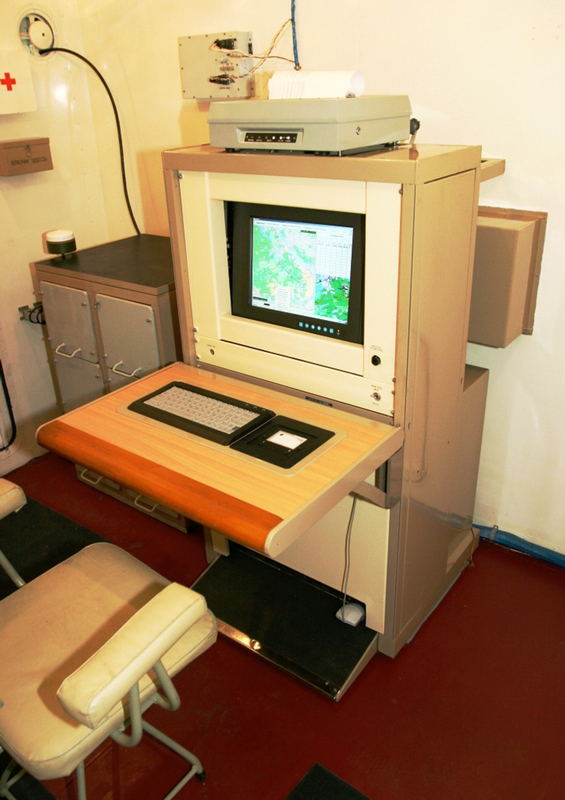 Operator console in the RMO container (Author). 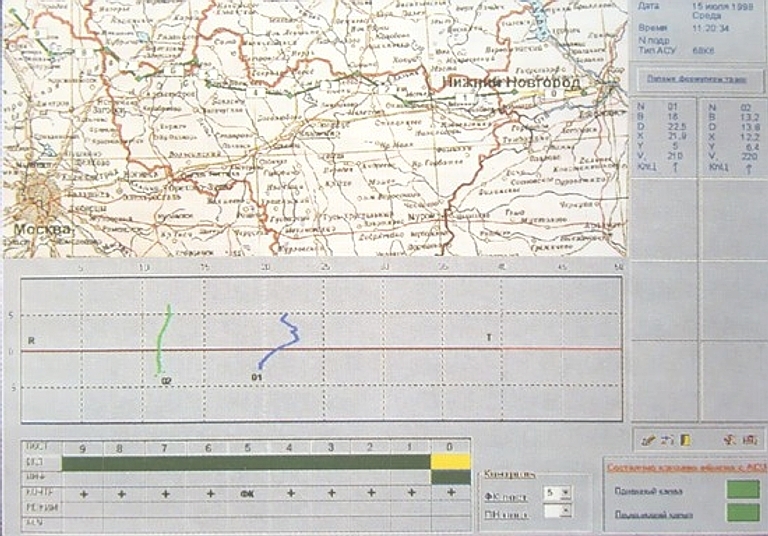 Barrier E operator display with digital map and track data (NNIIRT via RusArmy.com).